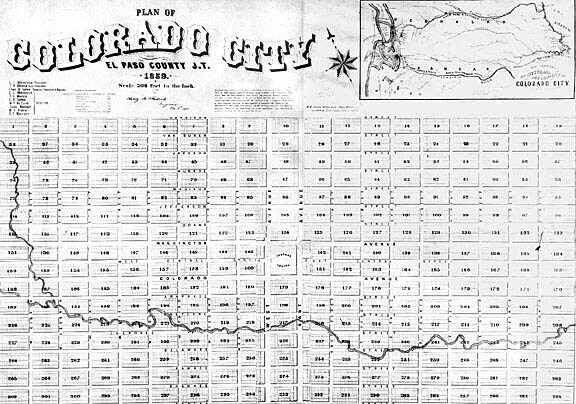 This is the original real estate plat (layout of street, block, and lots) of Colorado City, 1859, which was used by Colorado City Town Company to sell lots, and build the new city. While later changes in street names (EXCEPT Colorado Avenue)and numbering means you have to follow our later maps and keys, the core layout of the original Colorado City is unchanged to this date. The extreme right border is today's 13th street, the left, 32nd street. "Central Square" is not Bancroft Park. It is one block west. Fountain Creek still follows roughly the same course.